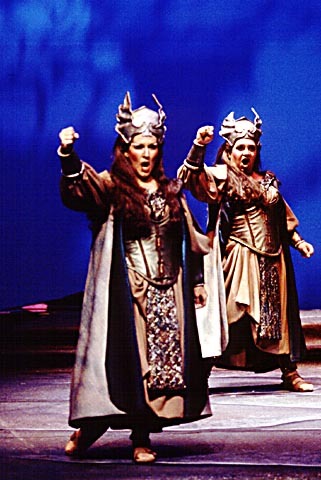 The voice you hear getting louder is Brünnhilde practicing Götterdämmerung. Thats because the search is all but over for “the most sought-after particle in modern physics” – the Higgs Boson. Update: In March 2013, while there are a few loose ends, it appears that a Higgs Boson is detected. See “Closing in on Higgs Boson Certainty, But “Standard Model Higgs” Remains Distant“. 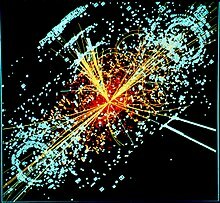 The most expensive science experiment in history, the Large Hadron Collider, has failed to find the Higgs Boson which is required for Big Bang and Expanding Universe ideas (as well as its role as a key component of particle physics “Standard Model“). The hypothesized particle was not (yet) found within the wide range of values for mass where it needed to show up. The imaginary Higgs Boson was supposed to be the reason particles have mass. It was supposed to show up somewhere between 50 and 460 GigaElectronVolts (GeV). However, after colossal amounts of research — neither claim has any supporting evidence. However, not all values have been ruled out, only about 90 percent. Some SuperSymmetry supporters still have hope that the Higgs will be found in the less heavy part of the scale between ~ 115 and 145 GeV. This area is not yet fully investigated because it is much more work to find a light Higgs than a heavy one. Commentary: I’ve never been comfortable with the Higgs Boson hypothesis because it had claims that seem to contradict classical physics at human size scales. One hypothesis required that the particle only interact with itself. This raises two difficult questions: If it doesn’t interact with anything else – how can it be detected, and how can it interact with anything to create something, including creating mass. The other problem I found was — how could such an extremely short lived (sub micro-second) particle provide continuous gravity? Because Big Bang requires this Higgs Field, failure to find a Boson weakens the Expanding Universe models/conjectures. Note: It is not well known that there are particle physics concepts that do not include Higgs Bosons (“Higgsless models“), however these models do not integrate with, or support, and may even contradict, Big Bang. This entry was posted in Basic Science, Particles and tagged Big Bang, Expanding Universe, Higgs Field. Bookmark the permalink.